It's the ultimate chronograph, a watch designed for racing, which ended up becoming an icon on and off the track. James Marks talks about the longstanding relationship between the best of two worlds. In early 2013 Rolex became a Global Partner and official timepiece of Formula One, but Rolex’s history of close ties with motorsport reaches back to the 1930s and beyond the pinnacle of single seater racing and into the world of endurance and more recently historic. There are the parallels between not only the global sport and the ultimate strive for engineering perfection, but also its heroes that is fascinating. The launch of the Cosmograph, the model now synonymous with motorsport and in particular the addition of the Daytona logo dovetails beautifully in terms of chronology with the beginning of the racing career of Rolex ambassador, World Champion and Legend Jackie Stewart in 1964. 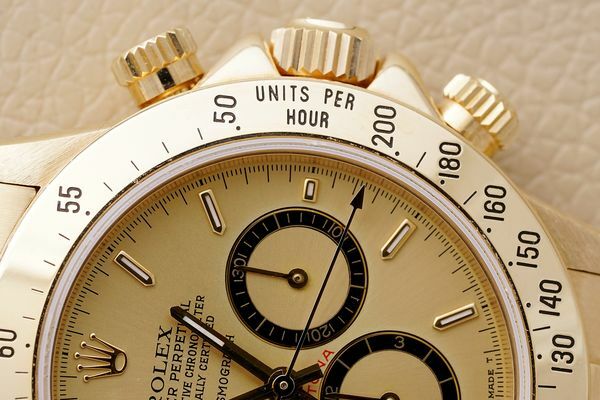 The Rolex Cosmograph Daytona "Paul Newman" Reference 6239 won by LeeRoy Yarbrough in 1969. 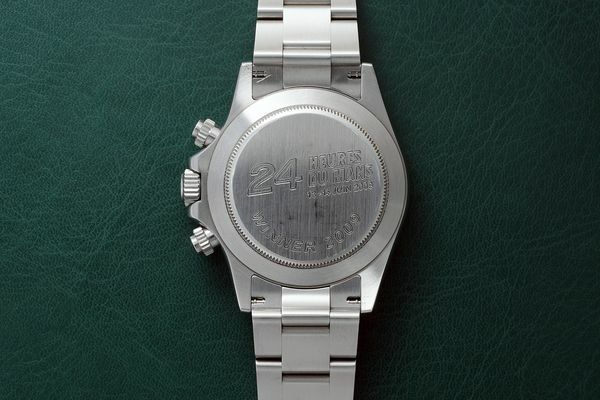 Across the “pond” as this titan of Formula One was winning his first of three Championships in 1969, Lee Roy Yarborough was being presented a 6239 Black Dial Paul Newman for winning the Daytona 500 and later that year the World 600 and the Southern 500. These wins, in one season, at NASCAR’s “richest” race, “longest” race and “oldest” race respectively gave Mr Yarborough the elusive “triple crown” title and the additional satisfaction of being the first person to accomplish the feat. Phillips had the pleasure of selling this beautiful and historic Daytona (seen above) in New York in December 2008. A "Le Mans Winner" sold during The Daytona Ultimatum in 2018. So whether you look at Formula One and NASCAR during the early primitive days of the Cosmograph or during the later in house movement period with the great Tom Kristensen winning nine 24 hours of Le Mans and six 12 Hours of Sebring, Rolex has been at the centre of the motorsport world. 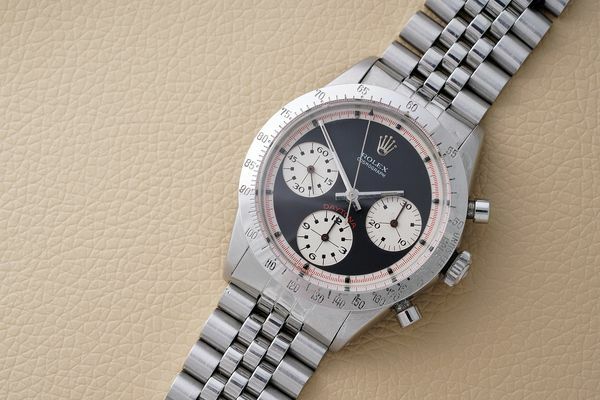 And like the history set by the championships of these great drivers, the watch itself holds the ultimate accolade as the most expensive wrist watch of all time following the sale of Paul Newman’s own 6239 for 17.8 million USD. Newman, himself, finding his passion for racing in the 1969 film Winning, playing race car driver Frank Capua. 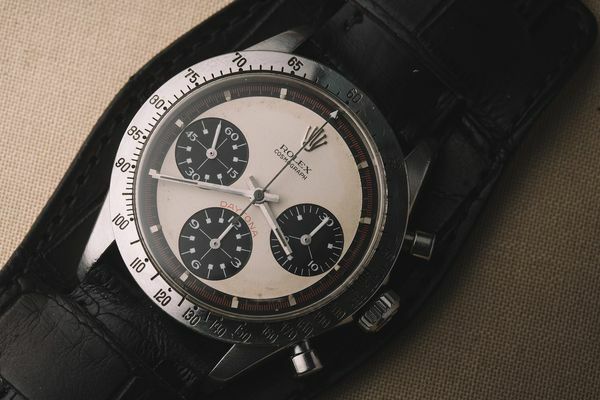 Paul Newman's Rolex Cosmograph Daytona Reference 6239. Paul Newman's "Paul Newman", given to the actor by his wife, actress Joanne Woodward, with a personal engraving on the back. Taking place at the Indianapolis 500 Motor Speedway, the movie launched an ancillary auto-racing career using the same methodical discipline that allowed him to hone his acting skills, he trained relentlessly and became a skilled driver. That result finally placing the Daytona on the ultimate pedestal of being associated with the danger, glamour and exclusivity of motorsport and the confirmation from the watch community of the unique hold these watches have on collectors. You can’t say whether that hold is exclusive to the aesthetics of the watch or the connection to the fast lifestyle and fascination of motorsport, but it is a unique mix that captivates generation after generation. 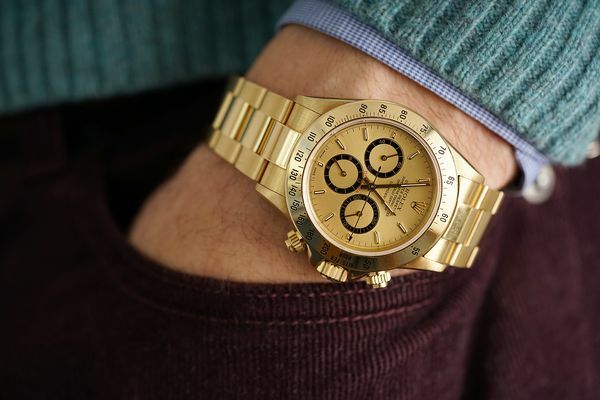 And on a personal note, as a Daytona collector and lover for over 20 years, I will always associate Rolex and the Daytona with motorsport. As a small child watching Grand Prix on a Sunday with the famous scarlet cars racing past the famous green and gold hoardings to seeing legends such as Lauda being interviewed wearing his own 6239 for a snippet of information to try and judge the result of a race the Daytona seems to have always been there. 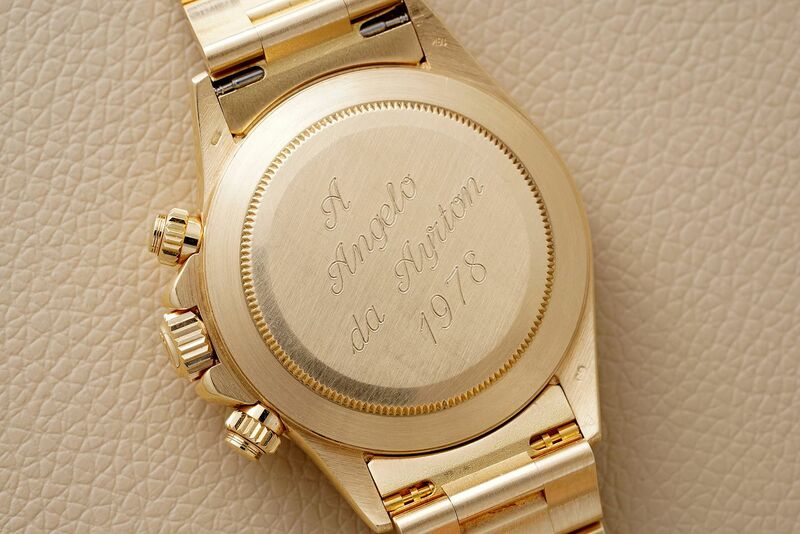 And now full circle, 25 years after the death of the great Ayrton Senna my love and passion for both watches and Formula One have collided in one spectacular offering. I will never forget the magic of seeing this 16528 for the first time, the flash backs to my childhood and the realisation of holding a small piece of history. 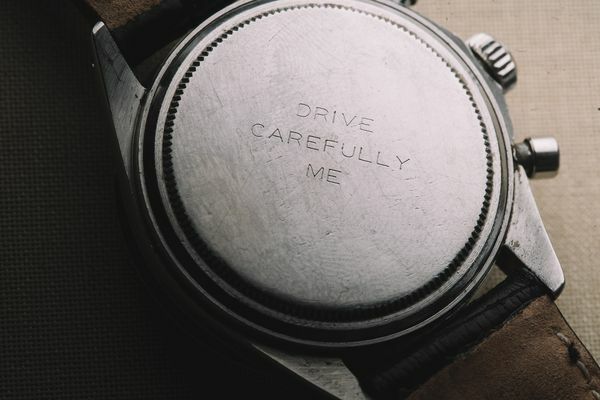 Engraved case backs are synonymous with unique milestones in an individual's life or career and that is especially poignant in motorsport. But what is unique is the juxtaposition between the cold hard commercialisation of some engravings for winning a race to the gift from a relative with an emotional engraving that in some way they hoped offered a veil of protection to the beneficiary. This fact was demonstrated more than ever in the 1960s and 1970s when on average a driver had a 20 percent chance of dying in every race he entered and yet the commercialisation of Formula One and its star drivers was at its highest. Arguably the greatest of all time, at the peak of his career and yet yearning for a pure motorsport where skill and passion were more important that money and politics is a very unique proposition that offers a unique insight into the mind set of one of the world’s foremost drivers. Yet again, a touch of that Daytona magic.